A few dozen locals braved the cold on February 16th to march in the streets of Toronto’s iconic Kensington Market. They were protesting plans to open a big-box supermarket in the neighbourhood. Developer Tribute Communities plans to break ground soon on a condo development on College Street—just east of the market’s northern entrance—that will include a 20,000-square foot Loblaws store. 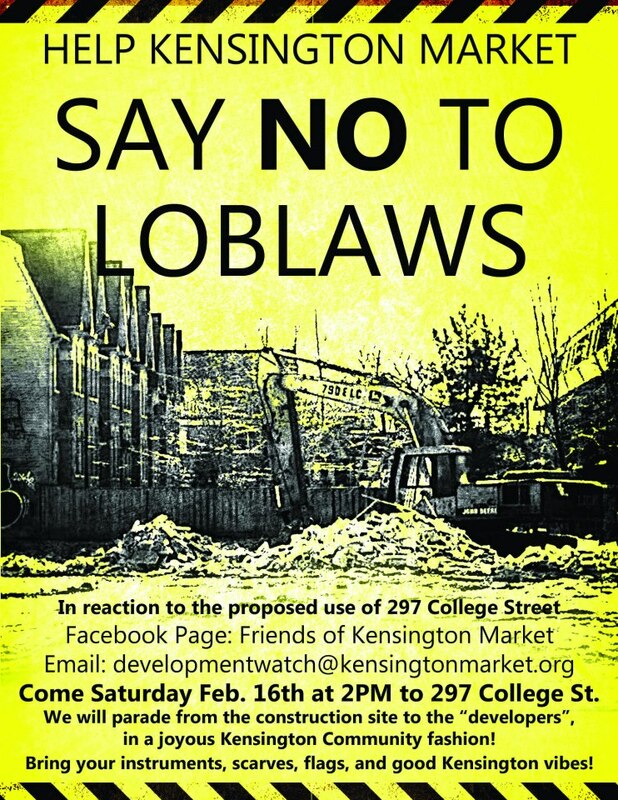 Demonstrators from the group Friends of Kensington Market fear that Loblaws will damage the community by driving the small shops that give the market its character out of business. 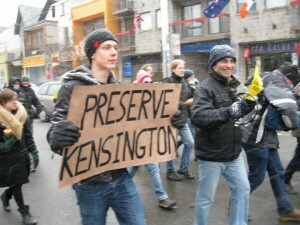 As they marched down Augusta Ave., the Friends held signs reading “No Loblaws No” and “Save Small Kensington Businesses”. In an interview with the CBC, market shop owner Anna Cecilia Espinoza worried that the arrival of big retail could spell the end of small businesses like hers. A “Save Kensington” petition has since been started on Activism.com. News of the development comes at a time of acute insecurity about how rising property values are changing the area (by bringing in more chain stores, higher rents, etc.). The recent closure of local café Casa Acoreana has led some to speculate that the area has reached a “tipping point” for gentrification. 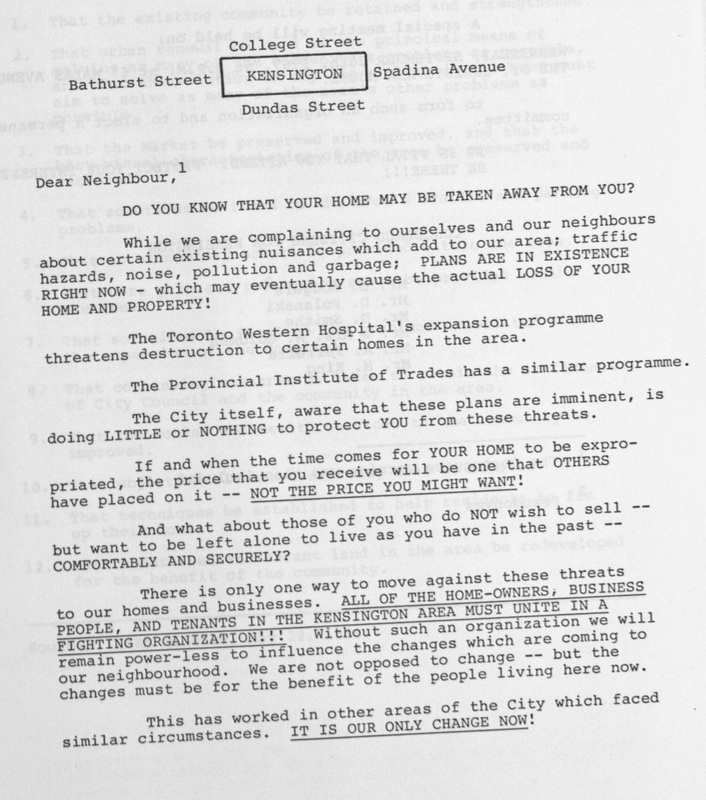 Recently, my own research has led me to read about community responses to urban planning and development in Toronto in the 1960s and 1970s. I’ve been struck by the degree of success of certain downtown communities during that period at organizing and having their voices heard on projects that threatened their homes and neighbourhoods. One was Kensington Market. 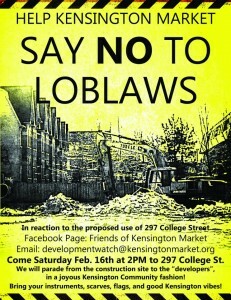 This post fits the Loblaws protest into a larger history of people in Kensington speaking up about the market’s future. 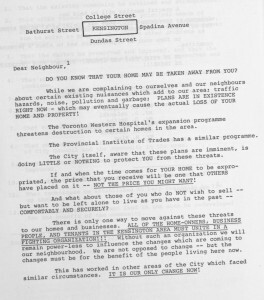 In the 1960s shop owners and residents organized to have their say in neighbourhood planning. While they weren’t able to follow through on many of their own plans to improve the area, they did set up an innovative community-based planning model, and blocked or altered several projects that would have dramatically changed the neighbourhood. Today’s Kensington owes a lot to those efforts to keep the area’s character intact. And that may be one of the best arguments for taking opposition to big-box retail in Kensington Market seriously. The market area today and sites discussed in this post. Map tiles by openstreetmap.org. The area that is now Kensington Market acquired its eclectic, bohemian vibe through more than a century of change. The influential Denison family owned most of the land that is now Kensington before it was subdivided in the 1850s. Since then, several waves of immigrants—first British, but soon followed by Jewish, Portuguese, Caribbean, Chinese and others—have occupied the area. Small family shops dotted several blocks in the area’s south-east, giving the market an Old World feel and encouraging a sense of community among its diverse, but mostly poor or working-class, residents. By the 1970s the area was famous throughout Canada as the inner-city “ethnic” neighbourhood par excellence, in part because of the popular CBC sitcom The King of Kensington. From the sixties onwards it also became known as a destination for the counterculture, attracting students, artists and other hip residents. As property values rose, those populations mixed with recent immigrants. Family groceries now sit side-by-side with coffee shops, used-clothing stores, art galleries, and, more recently, a few higher-end boutiques, restaurants and bars. The area tends to be a hit with tourists visiting the GTA, and monthly summer Pedestrian Sundays have become a big draw. The market full of life in the early 1970s. Source: Ellis Wiley/City of Toronto Archives. Like all of downtown Toronto, the market has changed drastically since it first became a neighbourhood. But one constant over the past fifty years has been area’s ability to mobilize against unwanted change. It began in the early 1960s, at the apogee of Toronto’s wave of postwar urban renewal. Politicians, bureaucrats and developers planned a series of large-scale, capital-intensive projects to cope with population growth, reduce the city’s housing shortage and help reshape Toronto into a world-class city. Such plans included subway and expressway expansion as well as the removal of dozens of blocks of housing to make way for apartment towers and townhouses. 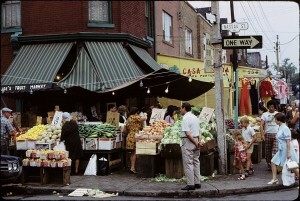 Kensington Market was one area singled out for transformation. Planners cited its poor housing stock, unclean streets, and traffic congestion problems as reasons for redevelopment. As early as 1962, the city produced an abortive plan for rerouting and pedestrianizing several of its streets, receiving cautious support from local businesspeople. 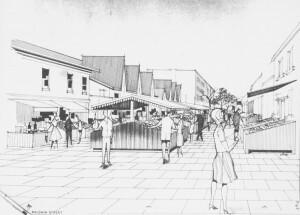 The city’s 1962 plan for Kensington. Source: City of Toronto Archives. September 1967 call for the first public meeting of the KARA. Source: Douglas Rigby/City of Toronto Archives. 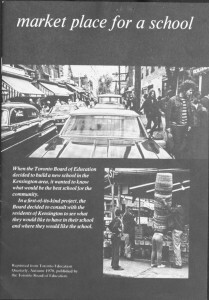 Pamphlet on the 1970 Kensington Community School consultations. Source: City of Toronto Archives. The KURC functioned until 1970. The results of this dynamic period of neighbourhood mobilization were largely positive. 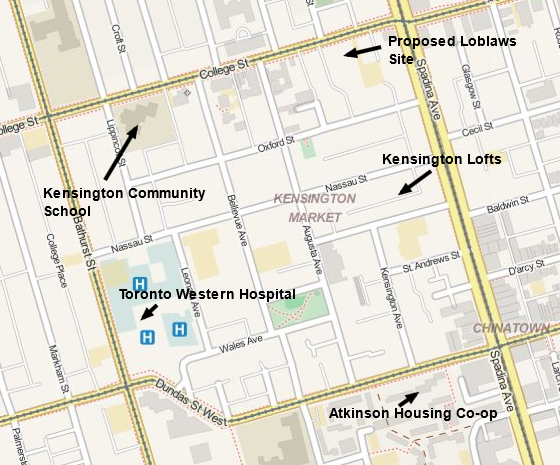 The hospital’s expansion occurred in consultation with its neighbours, and George Brown’s campus did not grow at the expense of local shops and houses. Meanwhile, the plan for single-use apartment towers on College St. was defeated. Instead, the lot was acquired by the Toronto Board of Education (TBE). 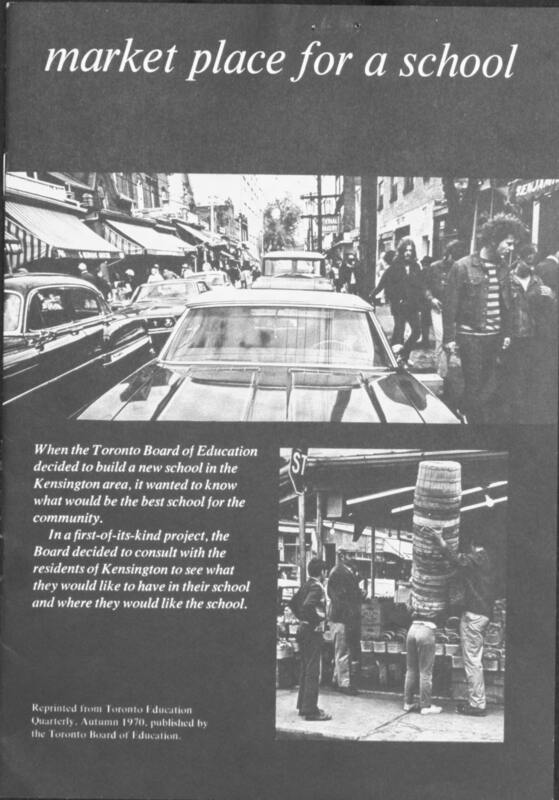 Following the lead of the KURC, the TBE conducted an exhaustive consultation process with locals—the first of its kind—resulting in a project (the Kensington Community School) that had widespread neighbourhood support. 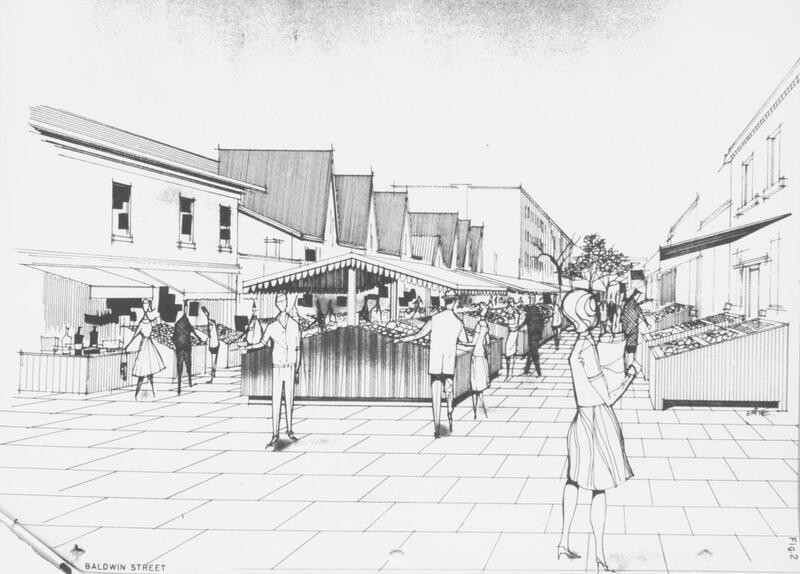 On the other hand, pedestrianization and other solutions to overcrowded streets remained elusive, and the KARA and KMBA were not able to maintain neighbourhood unity beyond the early 1970s. 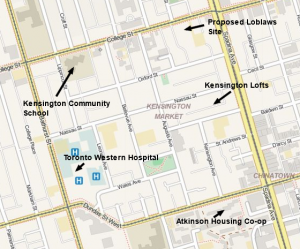 Nonetheless, the consultations surrounding the KURC and the TBE’s work in Kensington broke new ground in terms of community involvement in city planning. Daniel Ross is a PhD candidate in history at York University. His research focuses on the 1960s and 70s, and he is currently studying the history of cycling activism in Canadian cities. He blogs at historiandanielross.com.